Plus, with our new and improved IdealShake you'll be getting 11g of 100% whey protein. After carefully considering your feedback we’re excited to transition to a new, all whey protein formula. Whey protein is easy to digest and quickly absorbed by your body. The new all whey formula gives IdealShake a velvety-smooth, rich and thick texture. LOSE WEIGHT. This low-calorie weight loss drink gives you energy AND quenches your thirst. Best of all, it's guilt-free! IdealBurn is a supplement designed to support your transition into a healthy lifestyle. Changing your diet to lose weight can make you feel tired and grumpy. It's no wonder it’s so hard to stay motivated on your weight loss journey! Thermo Oxidation Blend: Promotes healthy metabolism and fat oxidation. Neuro Energy Blend: Supports focus and wakefulness. The Thermo Oxidation Blend plus Neuro Energy Blend contained in IdealBurn harness the double benefits of green tea and caffeine. The caffeine in IdealBurn is an aid to both focus and attention as well as endurance and fat oxidation (the breakdown of fatty acids). Green tea is a natural source of caffeine and is rich with catechins, which can also support fat oxidation. Together, green tea and caffeine can support you in your pursuit of the results you’re looking for: a healthier diet, a healthier lifestyle, and a healthier Ideal. 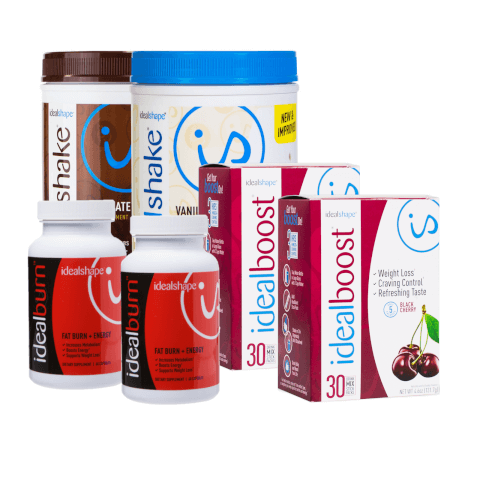 IdealBurn is there to support you with focus and positive mood as you jumpstart your weight loss journey.